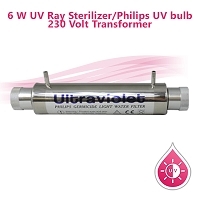 If your water source is known to be unsafe with microorganisms and you want to have extra protection, we suggest adding an UV sterilizer as an additional stage to disinfect water. Our ultraviolet filter kills 99% of harmful bacteria in point-of-use filter systems and is FDA approved for disinfecting filtered water. 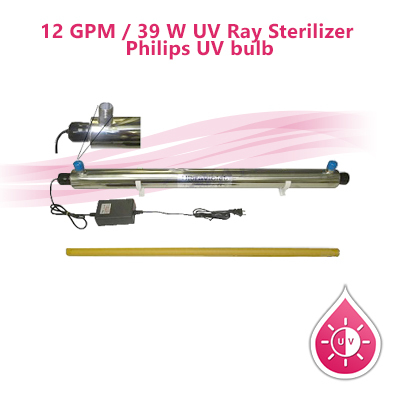 The UV lamp slides into a quartz tube which is sealed from the water and a purple color shows through the plastic flow fittings while it is working .The lamp will stay on continuously, and the water flow is restricted to 12 GPM to allow time for the water to be irradiated by the ultraviolet light. Physical Dimensions: Approx. 37"x 2.5"